Methimazole is an anti-thyroid tablet administered for the treatment of hyperthyroidism in cats. Hyperthyroidism, often known as Graves disease, is an autoimmune disease that causes hyperactivity within the thyroid gland leading to the overproduction of the thyroid hormones thyroxine (T4) and triiodothyronine (T3). Metehimazole is the generic of Tapazole. Hyperthyroidism is a condition that may lead to weight loss, abnormal appetite, and heart issues. In this instance, the medication works by restoring the thyroid hormone levels back to normal by interfering with iodine, which plays a major role in thyroid performance. Overall, Methimazole has been proven incredibly effective against Graves disease in cat's. Side effects occur in less than 5% of all cases, but can be serious, such as a decreased white blood cell count (agranulocytosis); contact a veterinarian immediately if your pet display signs of a sore throat. Excessive bleeding can also occur as a result of a decrease in blood platelets. 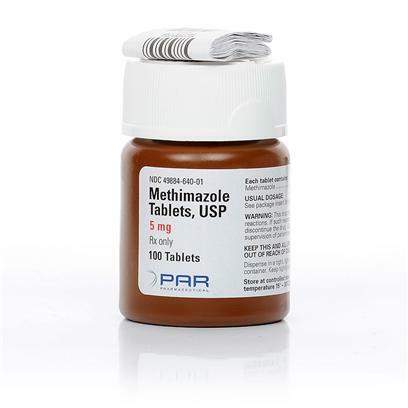 Very rarely, liver failure and its ensuing complications have been associated with Methimazole. More common side effects are skin-related, including rash, itching, hives, abnormal hair loss, and skin pigmentation. Other side effects may include swelling, nausea, vomiting, heartburn, loss of taste, joint or muscle aches, drowsiness, dizziness, numbness, and headache. Do not use in pregnant or nursing animals. Do not take with theophylline (Theo-Dur), warfarin (Coumadin), digoxin (Lanoxin), a beta blocker such as atenolol (Tenormin), metoprolol (Lopressor), or propranolol (Inderal). Talk to your vet before starting any serious treatment plan.